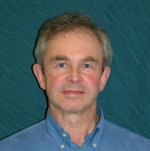 Chris Eilbeck has been at Heriot-Watt since 1973, except for the year 1983/84, which he spent at the Center for Nonlinear Studies, Los Alamos National Laboratory, New Mexico. Prior to coming to Edinburgh, he took his undergraduate degree (BA in Theoretical Physics) at The Queen's College, Oxford, and his PhD in the Department of Physics, University of Lancaster. He spent a post-doctoral year at ICTP, Trieste, followed by a spell as a RA in the Department of Mathematics, UMIST. He was Head of Department at Heriot-Watt for the period 1984-89, and Dean of the Faculty of Science 1998-2001. He was visiting fellow at Corpus Christi College, Cambridge, Oct-Dec. 2001, and at the Mittag-Leffler Institute, Stockholm, Nov-Dec 2005. His current research interests are in the study of solitons, both in the numerical study of solitons on lattices, and the use of computer algebra to study exact periodic and quasiperiodic solutions of soliton and soliton-related problems in mathematical physics. One lattice equation which he has worked on a lot is the Discrete Self-Trapping equation, a generalized discrete Nonlinear Schrödinger equation. Recently he has worked with Russell, Marín and Cruzeiro-Hansson in studies of localised lattice modes and applications to HTc. In addition he works on the corresponding quantum problems. He has a long-running interest in numerical and analytic studies of reaction-diffusion systems, travelling waves and pattern formation in physiology, embryology and ecology. His most recent work is in the theory of Weierstrass functions for curves of higher genus, see the Weierstrass web page which is under construction. This work has even lead to some new results in the genus 1 case. Some photographs taken at various ICMS and other meetings are shown here. He is a keen mountaineer and likes listening to modern jazz. pp 640, London: Academic Press (1982, reprinted 1984). Russian edition: Mir Press, Moscow (1988). Rock Climbing in the Lake District A.G. Cram, J. C. Eilbeck, W. Birkett, Constable, (1987). Some 16mm computer-produced cine films made in the '70s and '80s. Some of my older papers published in obscure conference proceedings which are now difficult to obtain. J. C. Eilbeck, V. Z. Enolski, S. Matsutani, Y. Ônishi, and E. Previato, International Mathematics Research Notices, 2007, Art.ID: rnm140 (38 pages), 2007, Abstract, PDF Copy. Localization and Transport of Charge by Nonlinearity and Spatial Discreteness in Biomolecules and Semiconductor Nanorings. Aharonov-Bohm effect for neutral excitons. F. Palmero, J. Cuevas, F.R. Romero, J.C. Eilbeck, R.A. Römer, and J. Dorignac. In S.E. Lyshevski, Ed., Handbook on Nano- and Molecular Electronics, pages 15.1-15.31. CRC Press (Taylor and Francis Group, Florida), ISBN: 0849385288, 2007. Evidence for moving breathers in a layered crystal insulator at 300K. F. M. Russell and J. C. Eilbeck, cond-mat/0612066, Europhysics Letters 78, 10004 (2007), doi: 10.1209/0295-5075/78/10004 . J.C. Eilbeck, V.Z. Enolski, and E. Previato, SIGMA (Symmetry, Integrability and Geometry: Methods and Applications), 3, 045, 2007. J. Cuevas, J. C. Eilbeck, and N. I. Karachalios, nlin.PS/0609023, Discrete and Continuous Dynamical Systems - Series A (DCDS-A), 21, 445-475, 2008. J.C. Eilbeck, V.Z. Enol'skii, S. Matustani, Y. Ônishi, and E. Previato, PDF copy, Journal für die reine und angewandte Mathematik (Crelle's Journal), 619, 37-48, 2008. J. Cuevas, J. C. Eilbeck, and N.I. Karachalios, PDF Copy, Dynamics of Partial Differential Equations, 5, 69-85, 2008. M. England and J. C. Eilbeck, arXiv link, J. Phys. A: Math. Theor. 42, (2009) 095210. J. C. Eilbeck, S. Matsutani, and Y. Ônishi, arXiv link, Phil. Trans. Roy. Soc. A., 369, 1245--1263 (2011). J. Cuevas, B. Sanchez-Rey, J. C. Eilbeck, and F. M. Russell, PDF copy, Discrete and Continuous Dynamical Systems - Series S, 4 1057 - 1067 (2011). F. M. Russell and J. C. Eilbeck, PDF copy, Discrete and Continuous Dynamical Systems - Series S, 4 1267-1285 (2011). Q. Dou, J. Cuevas, J. C. Eilbeck, and F. M. Russell, PDF copy, Discrete and Continuous Dynamical Systems - Series S, 4 1107-1118 (2011). J. C. Eilbeck, M. England and Y. Ônishi, LMS Journal of Computation and Mathematics, 14, 291-326 (2011). J. C. Eilbeck, M. England and Y. Ônishi, arXiv version, Proc. Roy. Soc. A, 470 20140051 (14 pages), 2014. J. C. Eilbeck, K. Eilers and V. Z. Enolski arXiv version, arXiv 1305.3201 (2013), published in Trudy Moskovskogo Matematicheskogo Obshchestva (Proceedings of Moscow Mathematical Society), v.74, N2, 2013, p. 297--315. Aniruddha Kibey, Rupali Sonone, Bishwajyoti Dey, J. Chris Eilbeck arXiv 1408.0212, Physica D, 294, 43--53, 2015. J. Bajars, J. C. Eilbeck and B. Leimkuhler, ArXiv 1408.6853 in Quodons in Mica, Springer Series in Materials Science, 221, Eds. Archilla, J. F. R., Jiménez, N., Sánchez-Morcillo, V. J., García-Raffi, L. M., 35-67, 2015. J. Bajars, J. C. Eilbeck and B. Leimkuhler, ArXiv 1409.0355, Physica D, 301–302, 8-20 (2015). A full publication list is available.